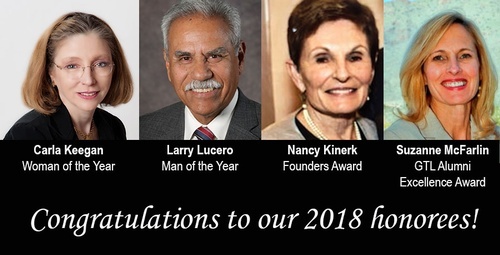 Greater Tucson Leadership is proud to announce the honorees for the 2018 Man and Woman of the Year, Founders Award, and GTL Alumni Excellence Award, presented by Lovitt & Touche. This year marks the 66th anniversary of the awards program. The honorees will be celebrated at a gala on Saturday, Feb. 9, 2019 at Loews Ventana Canyon Resort. The awards program honors a man and woman who have distinguished themselves for active support of community projects, demonstrated excellence in leadership, and who are a source of positive influence and inspiration for others. The Founders Award, established in 1985, is a lifetime achievement recognition honoring an individual who has demonstrated significant long-term community involvement and accomplishments and who has helped to shape the community in a positive manner with merit and dedication. The GTL Alumni Excellence Award was established in 2017 and recognizes an alumni of the GTL program who is positively impacting the Tucson community by actively utilizing the leadership skills learned during their time in the GTL program. These four recipients are being honored for outstanding leadership, distinguished contributions and dedication to improving the quality of life in our community. Larry Lucero, Senior Director of Government and External Affairs for Tucson Electric Power, has been selected as the 2018 Man of the Year. Carla Keegan, Co-Founder and Director of Taxation for Keegan, Linscott & Kenon, has been selected as the 2018 Woman of the Year. Nancy Kinerk, retired, former teacher, co-founder of Kino Learning Center, and charter member of Angel Charity for Children, is the recipient of the 2018 Founders Award. Suzanne McFarlin, certified personal coach and strategy consultant, 2005 GTL graduate, and former executive director of the organization, is the recipient of the 2018 GTL Alumni Excellence Award. A selection committee comprised of community leaders representing business, government, non-profit, and higher education made the awards selections. For more information on the Feb. 9 gala at Loews Ventana Canyon, visit www.greatertucsonleadership.org. Sponsorship and tribute opportunities are also available. For information visit the GTL website or call 520.792.2250 x141.